Currently, there are over 27 school districts in our network, from Montauk and Orient to Eastport South Manor.....and we're growing every month!! 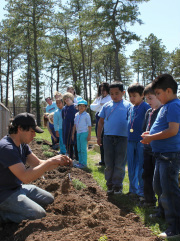 Going into its 7th year, the Bridgehampton School Edible School garden program continues to develop and grow. Parents, staff and students enjoy the garden's 30' x 36' heated greenhouse and 5,000 square feet of outdoor gardens. Two years ago, a community garden was started on site to bring more community involvement to the garden. Today, there is a very active parent group which helps maintain the garden. During the summer months, young farmers in grades k-6 can participate in the Young Farmers Farm-To-Table initiative learning how to grow and prepare delicious food on the farm and in the kitchen. The greenhouse/garden produces food year-round for the cafe and nutrition classes and provides a great forum for discussions on environmental stewardship. The latest addition to the garden is a row of twelve dwarf apple trees planted by the Halsey's. The excitement is growing at Bridgehampton! The Amagansett School has collaborated with Amber Waves Farm in what they call a “farm-to-fork partnership.” This is a program that runs throughout the school year as well as during the summer. During the 2010–2011 school year, sixth-grade students worked with Amber Waves as part of their service- learning curriculum. The students, under the direction of Amber Waves farmers Katie Baldwin and Amanda Merrow, planted a 3,200-square-foot garden. Crops included zucchini, cucumbers, popcorn, flowers and greens. Crops were grown from seed and donated to the Springs Food Pantry. The program encourages students to participate in all aspects of farming including planting, harvesting and cultivating as well as to establish an early and lifelong knowledge of land stewardship and healthy eating. a berry row and butterfly garden were established along with a composting center and rainwater catch-all system. CDCH is committed to integrating a school-wide Sustainability Curriculum and is partnering with surrounding schools and organizations to help ensure our children inherit a healthy East End and a healthy planet. CDCH would like to thank the following who have all played major roles in getting us up and growing! , Summerhill Landscapes, and Sunset Beach Farm. East Hampton's Elementary School garden is located in the school courtyard. Its inception was in 2013, with two raised beds approximately 4' X 16' each, built by farmer Jeff Negron. The original purpose was to enhance the after-school program, Project Most. Last spring, the children of Project Most grew peas, lettuce, kale, swiss chard, cucumbers, and tomatoes. 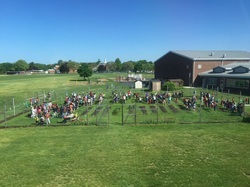 In June, the 4th and 5th graders involved in the growing of the produce, sold it at their mini-farmer's market, the 'Gingerbread Farm Stand' on the school grounds. The highlight, however, was the garden filled with sunflowers grown from seeds gathered from our high school garden. The children and adults were so excited to see the sunflowers flourishing when they returned to the school in September. The flower heads were used in the science classes and the seeds were roasted and shared with the students of Project Most and the newly formed after-school Garden Club. Just as plants grow, so will our school garden. Using the garden in 2015 is Project Most, the Garden Club, and the science classes. Recently there has been great interest in expanding our garden. Our wish is that the courtyard will be an outdoor classroom used by all children at JMMES. With the support of Project Most, the Garden Club and the science classes, we hope to expand the number of beds, start a compost program, and obtain a greenhouse, among other exciting ideas. It is a blank canvas which will support love of nature and knowledge of sustainable gardening practices. Stay tuned for future developments. 2017-2018 East Quogue Earth Rangers are excited to be the first class to have started a school garden! Program Coordinator, Justine Oudeans, along with the help from parents, and all of our students, have built our garden from the ground up! Garden Rangers have received immense support by many programs, such as: Cornell Cooperative Extension, Seed to Salad, Edible School Gardens, The Group for the East End, Slow foods of the East End. We have also received a grant that one of our parents, Vanessa Parsens applied for. We are looking forward to an exciting, fun filled and fruitful year! Eastport's Green Dream Garden was started in 2013 by educator, Maria Plitt, and sits at the entrance of Eastport Elementary School on Montauk Highway, surrounded by a white picket fence. The garden was recently expanded to 20 raised beds and 15 dwarf apple trees which are divided among the 3rd-6th grade classes. It is used to reinforce Math, Science, Social Studies and ELA lessons and is supported by School Administration, and funded by grants and donations from local businesses, Cornell Cooperative Extension, Slow Foods East End, Whole Kids Foundation, and Edible School Gardens. It is enhancing the school's curriculum and helping to make learning fun as well as feeding the community. They have a Farmer’s Market, run by summer garden club students to sell the produce. 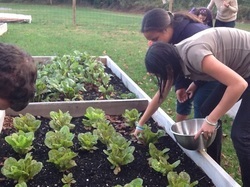 The Greenport School Slow Food Garden was started in the spring of 2011 by the school nurse and a teacher. Maryann Birmingham from Cornell Cooperative Extension, who is teaching nutrition to our students, put us in touch with the Edible School Gardens of the East End. It was with the group's guidance and support and a generous grant from Slow Food East End that were able to build our garden. The Garden is 15 x 40 feet with 8 raised beds surrounded by deer fencing. From the garden students have enjoyed Porter Pride Purple Potatoes, salad green, carrots, radishes and sweet potatoes. Our Home and Careers cooking classes used sweet potatoes, tomatoes, basil and eggplants from the garden. Summer produce was sold at the Greenport Farmer's Market to raise money for our garden. Our partner chef, Rosa Ross helped us develop and bottle our own Hanna's Balsamic Vinaigrette. This season our students are starting seedlings in the classrooms and are involved with making compost. The Good Ground School-Community Garden is located at the Hampton Bays Middle School on Ponquogue Ave in Hampton Bays, NY. It was established in partnership with Cornell Cooperative Extension and NYS Healthy Places Grant in 2011. The garden is home to over 30 community members and students within the district. Members grow a variety of produce in their 4' X 10' beds for their families, friends, and the local food pantry in town. Over the past 4 years our members have donated over 3,000 lbs. of food. In addition, students and staff enjoy growing organic tomatoes, cucumbers, carrots, lettuce, arugula, peppers, and much more. The teachers integrate both the garden and the greenhouse into the curriculum. The Hampton Bays School District offers a garden program to students attending the summer school program. We work with Whitsons, our food service provider, to include garden and greenhouse produce into the school cafeteria. Our students love specialty pizzas made with garden grown tomatoes, lettuces, and basil. The Good Ground School-Community Garden is unique because it allows for students and community members to share the joys of gardening through direct experiences and experimentation. The East End Edible Schoolyard at the Hayground School began 12 years ago. The late Jeff Salaway (restaurateur and founding parent of the school) had a dream of the entire school sharing a meal from the school garden. Since Salaway’s death, the school community has upheld his dream and turned it into a bountiful reality. The growing space includes two gardens, one greenhouse and a chicken coop. The students are currently researching and designing a medicinal plant garden, and a second greenhouse is being built. The school cafeteria is supplied with produce on a daily basis, and contributions from the garden are also being made to the Sag Harbor Food Pantry. Artichokes, purslane, edible flowers, collard greens, edamame and a variety of culinary and medici- nal herbs are among the items grown here. The students also maintain a stand at the Hayground Farmers Market, held on Fridays during the summer, selling seedlings and prepared foods like garlic-scape pesto and baba ghanoush. 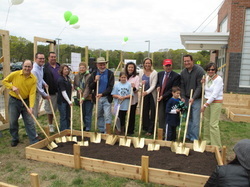 In April of 2014, Cutchogue Elementary School students and staff broke ground on a school garden. Now in its second year, the garden as become an integral part of the school's science curriculum. Sarah Maine, the Elementary Science Teacher, works with students, staff, and parents to oversee the growing of various fruits, vegetables, and herbs that are incorporated into healthy snacks and meals. Through participation in the garden based activities, students are learning about various science concepts, the care and management of a garden, where food comes from, and habits for a healthy lifestyle. This past fall the garden program has expanded to include a grow lab in the Elementary Science Lab, and an indoor growing classroom and outdoor greenhouse at the Mattituck High School. In addition to the agricultural based science classes, students have the opportunity to ﻿participate in after school garden clubs at both the elementary and secondary levels. 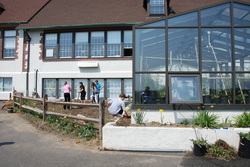 The Montauk School has had a greenhouse in one form or another for about thirty years. Renovated in the year 2000 with funds from the Concerned Citizens of Montauk (CCOM), the 20 by 12 foot structured is attached to the science room overlooking the ocean. The greenhouse is used by the Garden Club, a structured period in the school day, and supervised by Todd Brunn, a sixth grade teacher. Mr. Brunn has also expanded the area outside the greenhouse into an outdoor garden. The greenhouse is used by our students for growing plants and fundraising activities. This year the Montauk Community Garden is starting some of their seedlings in the greenhouse. The greenhouse is named for late environmentalist Carol Morrison, who was president of CCOM. 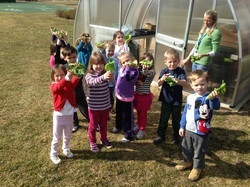 The Quogue School celebrated the opening of a beautiful new greenhouse last spring on Earth Day 2012. The 14 X 20 polycarbonate structure has provided Pre K through 6th grade students an opportunity to enjoy a more expansive year round gardening experience. Prior to the construction of the greenhouse kindergarten and second grade had outdoor raised garden beds. Now the whole school is becoming involved in the propagation,planting, and watering of various herbs, greens, and flowers. We have grown, harvested and eaten our first crop at our school All You Can Eat Salad Bar. We recently planted our next crop of greens, which we started from organic seeds. The students PreK through 6th grade have been working with cross age ‘gardening buddies.’ Our goal for the near future involves composting so that we can create our own organic soil. We also hope to attract community members of all ages to share and enrich our gardening projects. Second grade teacher, Suzann Henninger, started the Remsenburg-Speonk Elementary School garden in the fall of 2016. 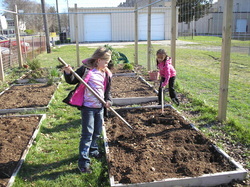 Through various fundraisers and community donations, the school was able to construct a 24x32 garden with 6 raised beds. Our goal for our first growing season is to grow enough produce for the entire school to share a meal at the end of June. Remsenburg-Speonk Elementary School would like to thank the following community members who have all helped make our garden a success: Slow Foods East End (for their generous mini grant that helped fund our garden fence), Bob Barauskas from Speonk Lumber (donated all the lumber for the raised beds), Eric Albert (built all the garden beds), RSE PTO (for their generous donation), Remsenburg Garden Club (for their generous donation), Chipotle Mexican Grill (for their generous donation/fundraiser), RSE families for all their generous donations, and the RSE administration and Board of Education for allowing this amazing garden come to life. 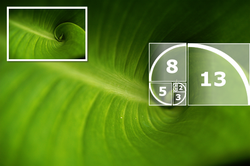 The Ross School edible schoolyard, the Golden Ratio Garden, is currently in the planning stages. A planned growing space of 50-by- 90 feet is in the works with a goal of integrating many classes into this garden-as-learning-space: art, science, wellness and cultural history. The produce will reflect global and historical varieties of plants. Harvests will include herbs and flowers for the café and will be used in cultural history lessons. Students have been working on the design and planning of this garden for the past year with a goal of having the garden up and running in the near future. The hope of this project is to instill a greater sense of awareness of the environment, nature and the cycles of life in the participants. Founded over a decade ago by Elementary Science Teacher, Kryn Olsen, the School Garden and Greenhouse Project at Sag Harbor School is a topographical representation of our East End ecosystems. Constantly in motion, the garden and outdoor classroom is utilized throughout the day by numerous staff for instruction and inspiration. As of Spring 2015, the new, all-volunteer Garden Committee merged with the original Local ECOWorks non-profit to breathe new life into the garden and to assist Ms. Olsen with maintenance and future growth of the already well planned space. School-wide work days and seasonal school garden "markets" are now part of the landscape at Sag Harbor Elementary with the goals of linking together the new, expanded garden and culinary initiatives of all Sag Harbor schools district-wide. Southampton School’s organic garden was started in April 2010. The garden is approximately 112-by-25 feet in size. Currently, gar- den club members and students in the food prep classes (ages 14–18) are participating in the planning and maintenance of the garden. The produce is used in the high school cafeteria with a goal of in- creasing the yield in order to provide produce to the elementary and middle school as well. Heirloom tomatoes, three varieties of carrots, broccoli and tomatillos are some of the items grown. The students also planted asparagus, although it will be two more years before they harvest any. A representative from the Cornell Cooperative visited the school and gave the students a demonstration on canning tomatoes and freezing produce for later use. Two of the goals of this schoolyard garden are to provide a hands-on learning experience for students as well as encourage a more sustainable way of living. Established in 2012, the Garden at Southold Schools instantly became a gathering place for the art and science of learning opportunities for your and old alike. Children and adults of all ages tend the garden, grow and harvest fresh produce and flowers. Salad greens, herbs, and other fresh picked vegetables are made available to the school cafeteria and offered at the local Farmer's Market and our Farm Stand located on the school grounds. The 4,200 square foot garden provides our teachers and students numerous ways to teach and learn about eating healthy and how things grow. We are looking forward to new projects such as a greenhouse that has been donated by a local farmer and should be completed by the spring of 2016. A Summer Farmer's Camp is also on the horizon. In 2008, two parents of students at the Springs School in East Hampton launched the idea of an edible schoolyard. Out of this idea sprouted the Project MOST Seedlings project. Through privately raised donations, enough money was raised to build a green- house with 10 beds. Additionally, there is now a 40-by-60-foot garden complete with deer fencing. The greenhouse was assembled by volunteer labor offered by community members; community service students and parent volunteers maintain the garden and greenhouse. In September 2009, the building of the greenhouse was completed and became part of the classroom experience for kindergarten through sixth-grade students in their science and health classes. The list of produce grown includes broccoli, peas, lettuces, tomatoes, spinach, cucumber, beets, kale, Swiss chard and sprouts. In addition, there is an herb garden producing pars- ley, cilantro, chives, sage, oregano and garlic. The harvested produce is used for culinary projects during the school year. Moreover, the Project MOST afterschool program offers a garden club to students and in summer 2011 launched the Seedlings Summer Learning Program. At the Tuckahoe Common School, the Stony Brook Community Roots program was started with a grant from Stony Brook University. Matt Doris (head of the school’s food services department) has maintained and worked on the garden since it was planted in the spring of 2010. The food produced is incorporated into the school lunches provided in the cafeteria. Raspberries, kale, chard, cilantro and green beans are a partial list of what is grown. Maximizing the yield of the available space is a major intent here; one example of this idea in action is the beans growing up bamboo poles along the perimeter of the garden. Approximately 20 percent of the produce goes toward the lunch program with the remaining 80 percent donated to local families who meet certain economic criteria. One of the goals of this school garden is to teach sustainable practices and connect the students (ages 5 to 13 years old) to the land where their food is grown.